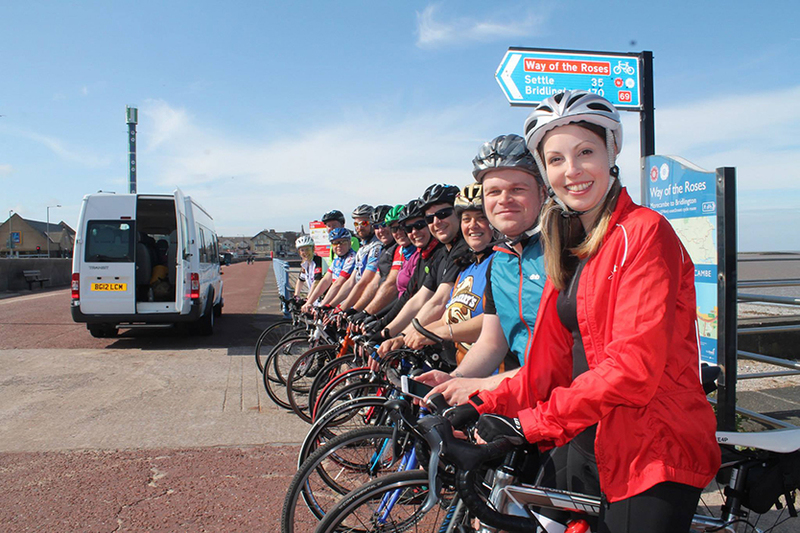 Last year we decided to embark on the epic journey from Morecambe to Bridlington across 3 days covering around 180 miles. 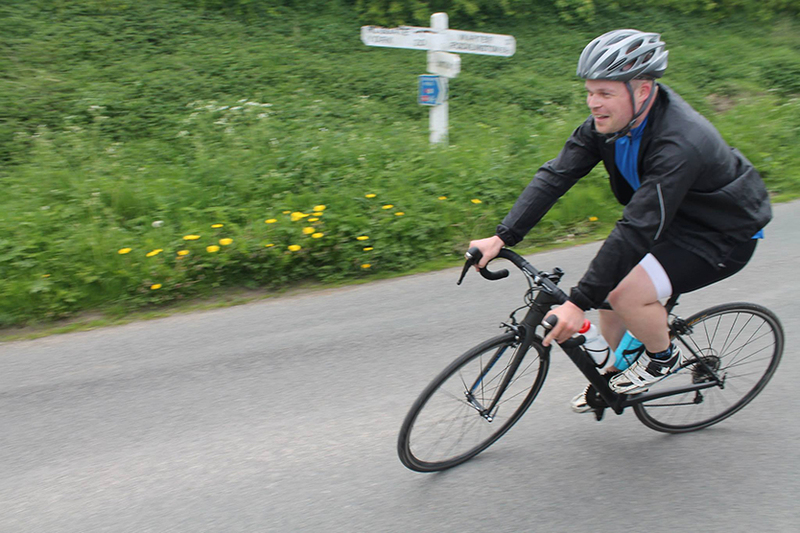 We wanted to complete this ride with staff, friends and clients and was raising money for Mind in Salford. 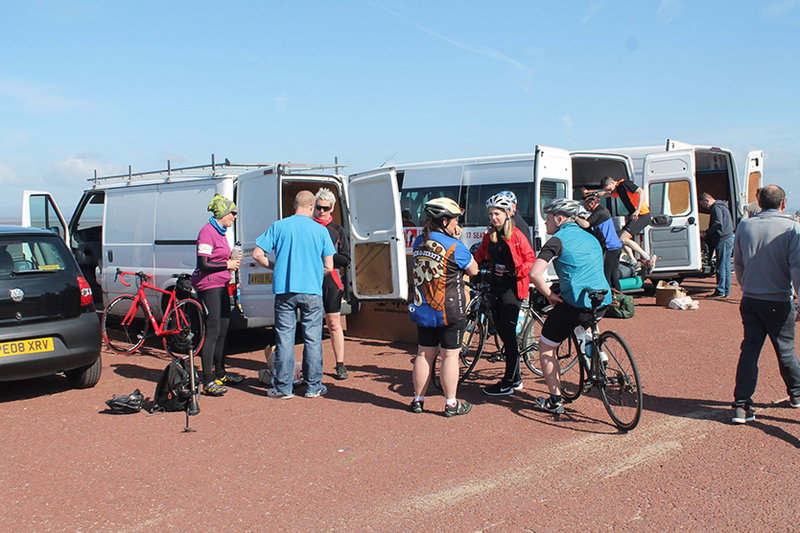 The idea came about doing a cycling trip together, as a few members of staff cycle on a daily basis to work and others cycle as a hobby. As we were doing this over the May bank holiday the training rides started in the coldest, wettest of winter mornings, evenings and weekends across Cheshire to Delamere forrest and heading over the hills at Rivington. We were even taking our bikes whilst visiting family in Wales and training around Lake Vyrnwy and Llanrhaeadr waterfall – but even the Welsh hills couldn’t prepare us for what was to come! Day one was an early start meeting at our office in Salford where we met up with Keep Britain Tidy before driving up to the start in Bridlington where we were also meeting Lusso Styling. 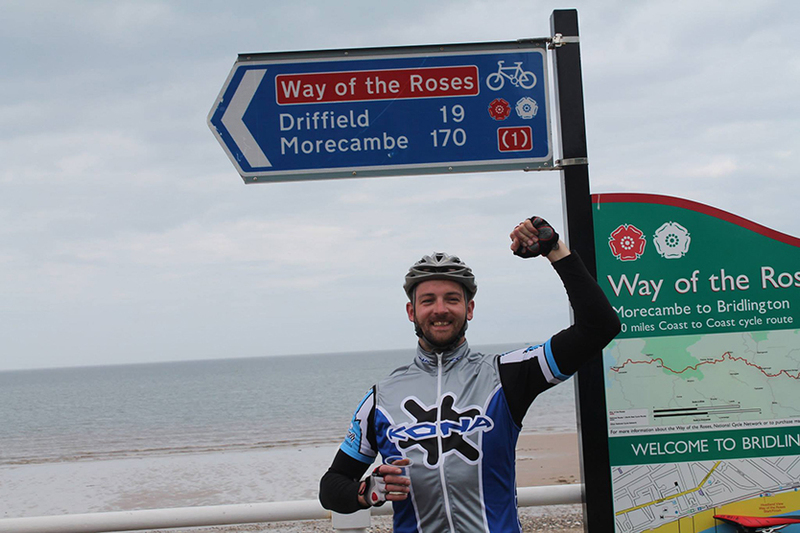 Once we arrived and unloaded the bikes, got the obligatory photo with the morecambe statue we headed off. Starting on a cycle path we meandered next the the River Lune in Lancaster and then we hit some small hills. Now, we knew that we were going to have a hard day but even the little hills had gasping at the top, little did we know that these were only small hills! The scenery at the top of these was amazing, the roads were almost empty of all traffic, it was incredible to get away from cars zooming past so you could really enjoy the ride and take it all in, crossing old stone bridges, historic villages – it really was beautiful. Around 30 miles in we hit Settle, literally hit Settle. The hill was huge – it felt like Everest. It went on and on, and was extremely steep, we all tried our hardest to get to the top but no one managed it without getting off and having a little breather. Once we got to the top of the begining section with our legs burning we all jumped back on our bikes to enjoy the rest of the climb before a quick decent. We had a quick lunch break before tackling the last stretch before Pately Bridge where we camped for the first night. We thought that after Settle that all the hills would be easy, but how wrong could we have been. Once we got to Appletreewick the climbing started again, this wasn’t as steep as Settle but it was longer, once we did get to the top again it was another quick and very steep ride into Pately Bridge and we were glad we weren’t riding back up that road the next day! Day Two was another early start, with aching muscles from the first day we were hoping that it would be an easy(ish) ride into York. The start didn’t hold up much hope! Right at the beginning we started climbing out of Pately Bridge past Brinham Rocks, Fountains Abbey and through Studly Park, we rode into Ripon for a spot of Brunch, once in Ripon we was also saw to a military parade. After leaving we thought we would carry on to York to get there early so we could all have a nice rest looking around the great City. Before we got to York I (Craig) got a puncture in the really nice village of Roecliffe and there was a tear in my tyre which wasn’t the best situation as it was bank holiday Sunday and was around 10 mile from the nearest bike store! I fixed the puncture and was hoping that the tyre would hold out until I got to the bike shop in York. Luckily it did, but we got to the bike store 5 minutes before closing. 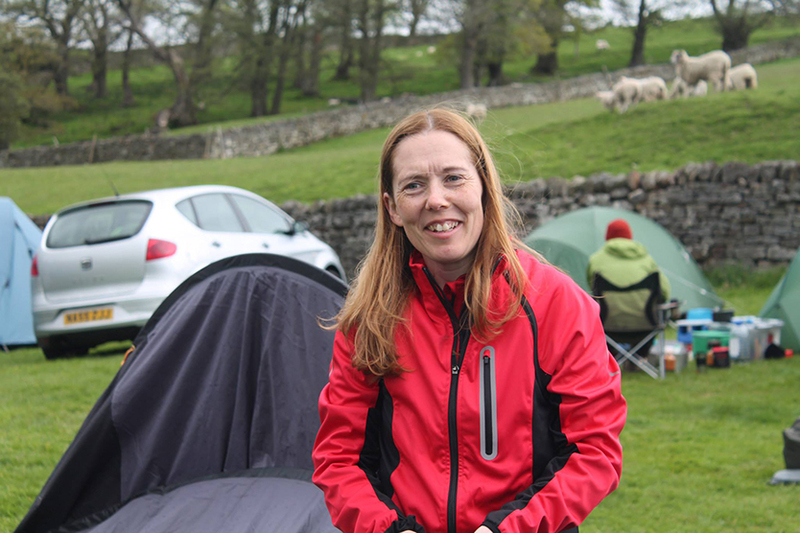 We were all glad to make it to York and was glad that we didn’t have to unpack the tents again as we were staying in a hotel next to the race course. 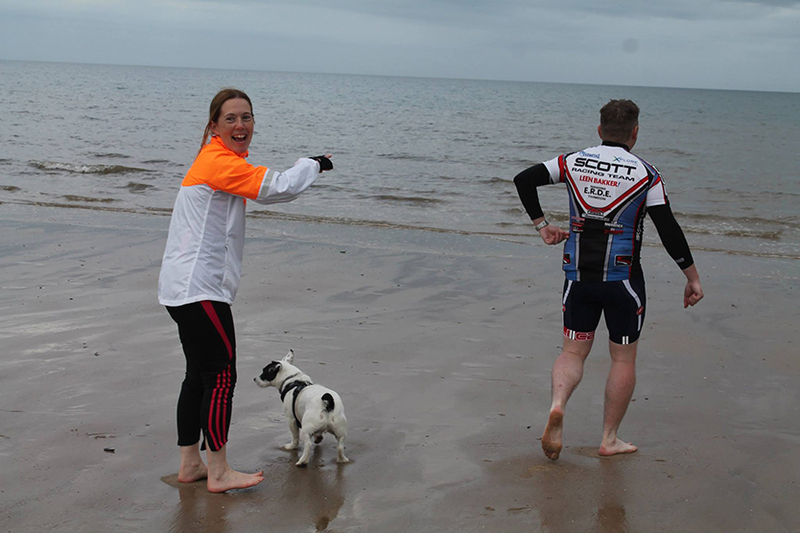 Day three was the final stretch to Bridlington, we were all very excited about making it to the end. 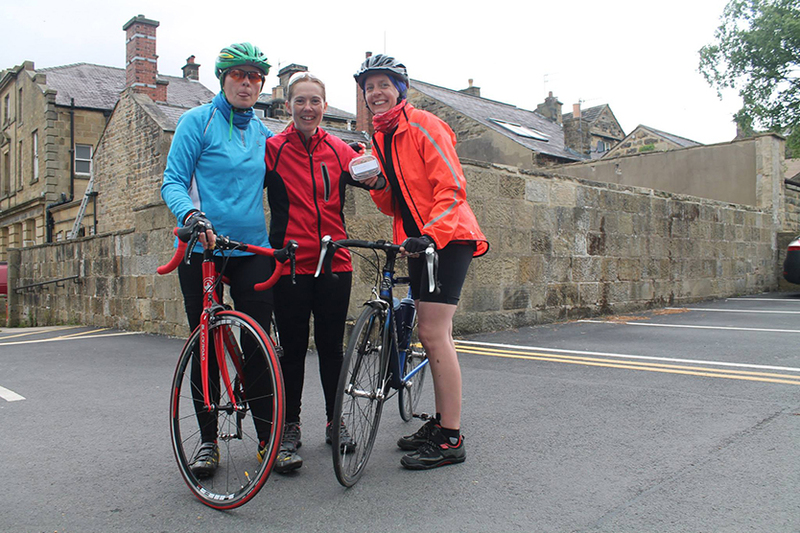 We started off by making a run right across the race course to get onto the cycle paths, rode through a rapeseed field in Gate Helmsley before tackling the last few climbs and stopped for lunch on the side of the road in Hutton Cranswick. Not long then we arrived in Bridlington, once we started hearing seagulls we knew we were close, we rode underneath a railway bridge and we could all see the sea, we were all cheering that we made it! After we rode across the sea front we jumped off the bikes, and ran across the sand to dip our feet in the sea and celebrated with fish and chips and champagne sitting on the beach. It was the greatest biking trip I have ever done and absolutely can’t wait to do it again in the future. All three days were packed full of beautiful scenery we couldn’t quite believe how nice it was and how quite all the roads were. We passed so many people of all ages also taking on the way of the roses having drivers stop us to give us more money to add to the donation we were going to make to Mind in Salford. Together we raised a total of £1900.00, we never imagined raising this much and we were glad it was going to a great cause. Hey! I'm Craig, one of the Creative Designers at Carbon.